I love Sarah Dessen, I do. And even though Lock and Key wasn't my favourite, it was still pretty good. I couldn't put it down. I just felt like there were too many characters and too much going on to fully address each thing properly. Some of the characters were a little one-dimensional, Ruby and her's family's dysfunction didn't feel quite right, but still, Sarah Dessen tells a good story. I like the premise of it. If you watch the video below, you'll hear Sarah Dessen talking about how she wanted to write a book about the huge changes that take place, moving from one place to another. And I think that's done fairly well in the book. We see the big contrast between living in this gated community with her sister and husband to the life that Ruby lived before, with her mother, and how different things are, from one place to the other. Different ways of communication and relationships. I can relate to that. I would have liked to have seen fewer people in Ruby's life so that she could connect in a more meaningful way. There's already so much to work with in dealing with Ruby and Cora, her sister who she hadn't seen in 10 years and who is the first person to have abandoned Ruby. Then there's Ruby and Jamie, Cora's husband. Then add the boy next door/love interest. But there's also Olivia, Gervais, Harriet and Reggie, Peyton, Marshall, Heather. Each with his or her own problems and quirks. They way things are, by the end, things felt rushed and some left hanging, unresolved. And (SPOILER ALERT) besides the family abandonment/trust issues of Ruby's, there's Cora's infertility, and Nate's physical abuse to contend with. I didn't see that coming at all, and in fact, I wish it wasn't there. It didn't feel genuine to me. And yes, it sounds like I have a lot of gripes with this book, but I still did enjoy reading it. Sarah Dessen is still one of my favourite authors. 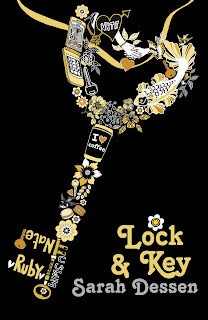 Have you read Lock and Key? What did you think of it? Which is your favourite Sarah Dessen novel? Now I know where I have seen the name Sarah Dessen. I remember picking this book up at Waterstones and being really interested in it. I saw the challenge everyone else is doing and I couldn't work out who she was. Get the feeling I would enjoy this one.